Begonia luxurians is an unusual species from the rain forests of Brazil that looks more like a palm tree than a begonia. It is also one of the biggest begonias, capable of growing to a height of 2.5 metres. Unusually, it produces enormous bunches of small, scented pink flowers. Anyone looking for a highly unusual houseplant need look no further than this extremely handsome conversation piece. 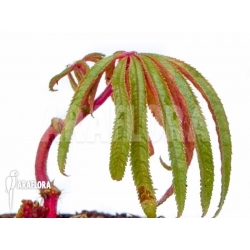 Begonia luxurians is a remarkable species with fan-shaped leaves. Each individual leaf is extremely slender and dark green in colour. The rest of the plant is deep red apart from its flowers. Begonia luxurians produces more than 100 pale pink flowers at a time in clusters on tall flower stems. They give off a pleasant fragrance. 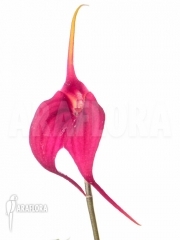 Begonia luxurians needs to be placed in filtered light. It can only tolerate direct sunlight in summer. It can be kept outdoors, provided the temperature stays above 15⁰C. Generally speaking, normal room temperature is best but it must never exceed 30⁰C. Humidity of 50% is the minimum to stop the plant from drying out, but 65% is best. Place the pot in a dish containing lukewarm water to keep the growing medium moist. The top layer of the growing medium must be allowed to dry out before the plant is watered again. Use standard fertiliser once every two weeks. Begonia luxurians needs to be potted in a peat-based mixture. See “Plant accessories” for details. Begonia luxurians is likely to become quite large in due course, in which case it can be pruned.